A woman who feels she has a vocation to the religious life should first get in close touch with one of our convents, in order to experience for 3-6 months what life is like there. After that she would be accepted into the community as a postulant. She then lives with the other sisters in enclosure and wears a simple dress and a medal as a sign of her affiliation. After a year the postulant would commence her novitiate. 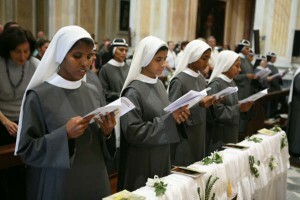 At her investiture she receives a habit and wears a white veil as a token of her brideship. “Amor meus crucifixus est” – during the following eighteen months of the novitiate her love for our crucified Lord and Saviour has a chance to grow and mature. A novice mistress accompanies the young nun along this decisive part of her way. Her task is to impart theological knowledge, to accustom her to the Rule of the Bridgettine Order and, above all, to help her deepen and develop her own spirituality. The novitiate ends after a year and a half with the so-called temporary vows. The novice promises to live her life in imitating Jesus, in poverty, chastity and obedience. As a sign of her deepened relationship with Jesus, she now wears the “crown” of our habit. 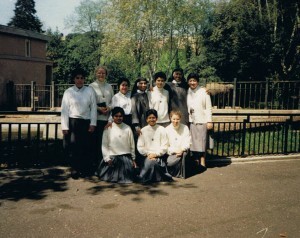 During the following five years the young nun becomes more established within the community of our order. 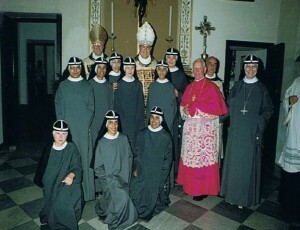 Then she makes her solemn profession in the presence of the general abbess. A ring – a sign of her fidelity to God – seals her total commitment to the Almighty.